Keep your necklaces knot-free and stop losing the backs to your earrings with a fun to make DIY jewelry holder. 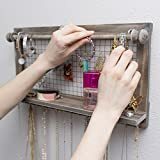 Here are 10 DIY jewelry holder projects that you can make with inexpensive, easy-to-find materials. Read through our tutorials to find the one that will keep your dresser drawers a bit more organized. 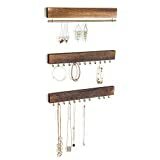 First on our DIY jewelry holder list, we have this elegant organizer that comes together easily and quickly. You can find interesting and attractive pulls and knobs online or at flea markets or thrift stores. Customize your choice of paint color to match your décor. Once you’ve gathered your materials, check out the tutorial below to get started. This project is an uncomplicated and inexpensive way to organize your necklaces. Opt for a wooden shirt hanger instead of plastic because you need to screw cup hooks into it. Use copper or brass hooks and leave the wooden hanger as-is for a classic look. Or paint it to match your décor and use black or white hooks to complement the color. Find the materials for these sophisticated tiered jewelry holders online or at the dollar store. These are a beautiful way to arrange and display some of your favorite jewelry pieces. Once you have your materials, follow the easy directions below. Recycle paper towel rolls into useful stands for your necklaces and bracelets. Find the rest of the materials online, at the dollar store, or at thrift stores. Add silk flowers and ceramic birds for a garden theme, or style it any way you like to match your home. Watch the tutorial to learn the technique. Next on our DIY jewelry holder list, we have this elegant jewelry organizer fit for a nature lover. It comes together quickly and inexpensively. You can find faux branches online, or you can gather some twigs from your yard. Tune in to the tutorial below to learn how to create this one-of-a-kind piece. If you want to organize your necklaces, try this DIY jewelry holder frame. Search online, at thrift stores, or even in your home for a wooden picture frame that fits your style. Be sure to opt for a wooden frame instead of plastic so you can easily screw in the cup hooks. Instead of sifting through a disorganized pile of rings, create a display to organize and properly store your rings. You can easily choose colors that match your bedroom or bathroom. Or, you can paint it to complement the inside of your dresser drawers. We also feature some really great ways on how to make your own DIY jewelry. The little holes in a sheet of a plastic canvas are the perfect size for holding all of your post or hook earrings. Simply decorate your canvas with a pretty bow made from wire-edge ribbon. In less than half an hour you’ll be ready to hang your new earring holder on the wall. Follow the instructions below to learn how to make it. These DIY jewelry holders are easy to customize for any age or style. Decorate the frames with paper, paint, and glitter. Insert a piece from a decorative radiator cover, add hooks, and you have a perfect way to organize and display earrings, bracelets, and necklaces. 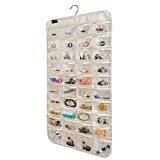 This jewelry holder hangs over the door for a convenient and decorative way to store and display your jewelry. Use three shadow box frames and a door mirror to create this DIY jewelry holder. You can find the supplies for this project online or at any hardware or craft store. See the tutorial below to learn how to make one for yourself. Finding a way to organize and display your jewelry is easy and fun. Watch any one of these tutorials to learn how to get started on your project today. But don’t be limited by the ideas you see here. Get creative and find ways to make your jewelry display match your own unique style. Share your ideas for a DIY jewelry holder and inspire others to create one for themselves. Which one did you like the most?